Quick Take: One of the better, more complex beers I’ve had in quite some time. You need to have some adventure in you as the flavor profile could be considered challenging, but that’s nothing new for this brewery. While this is more a successful novelty than pinnacle of their efforts, Guillemot contains the spirit of the brewery in a 500ml bottle. Brew Facts: Dark Saisons or Black Farmhouse ales are a relatively new take on the traditional, peppery French farmhouse style beer that adds roasted malts and dark fruit notes. There are relatively few to this point, but offerings from popular breweries like Ommegang and Goose Island, Three-Eyed Raven and Pepe Nero respectively, could eventually lead to an uptick in popularity. This 500ml of oak barrel-aged Dark Saison is a beer that Tired Hands has brewed twice (the original was released in 2013). The initial batch of Guillemot Nebula split time in Jim Bean and red wine barrels, however I’ve been unable to determine the breakdown for batch 2. Appearance: Strip the wax, pop the top, tip the bottle, and gravity takes over, pouring a beer that could hardly be bothered to fizz let alone froth up a head. That’s not to say the beer is as flat as Iowa, featuring a blanket level of tan/white bubbles that coat the glass on swirling. Guillemot has the appearance of condensed cola or a medium bodied coffee, or coffee with cola in it…you get the idea. It’s a different look than your traditional Saison, because it’s dark. Aroma: An initial sniff is rather interesting, revealing plum, roast and a touch of malt sweetness. There is a maply coffee quality to it that I can’t place and hints of earthy soy sauce. Not a big emphasis on the farmhouse, so don’t expect much funk, but intriguing aroma all the same. Had I experienced this in a blind tasting, I probably would have classified this as some mix of Porter and Belgian Strong Dark based on smell/appearance. Taste/Mouth Feel: A sip lets you know that those beguiling looks and smells do not tell the whole picture. Initial impression is a near syrupy, full mouth feel that is pleasant on the tongue with a lite, small-bubbled carbonation that is just right. The taste is thick with heavy dark malts and a tangy, vinous sour sweetness that borders on fruity plum/raspberry flavors. It finishes in a union of roast, salty sour and continuing dark fruits. As it warms, the metallic red wine, acidic and sour notes strengthen along with a slight medicinal quality. Although 8.5%, a coating heat warms the throat, but keeps away the boozies. Final Thoughts: One of the better, more complex beers I’ve had in quite some time. Not something I’m likely to have again given the intermittent release schedule and popularity of Tired Hands, but I’d love to taste what a year would do to this unique concoction. You need to have some adventure in you as the flavor profile could be considered challenging, but that’s nothing new for this brewery. The other tasters had varying levels of appreciation, but one did find it unpleasant enough to wish he hadn’t sipped it, so keep that in mind. Given Tired Hands bottle release schedule and the commitment one needs to get a bottle, the real question is how much effort is the right amount. For me, I wouldn’t have a problem showing up on the day of release right before the brewery opens and waiting as the line shuffles through, assuming you are in sane driving distance (an hour or so). 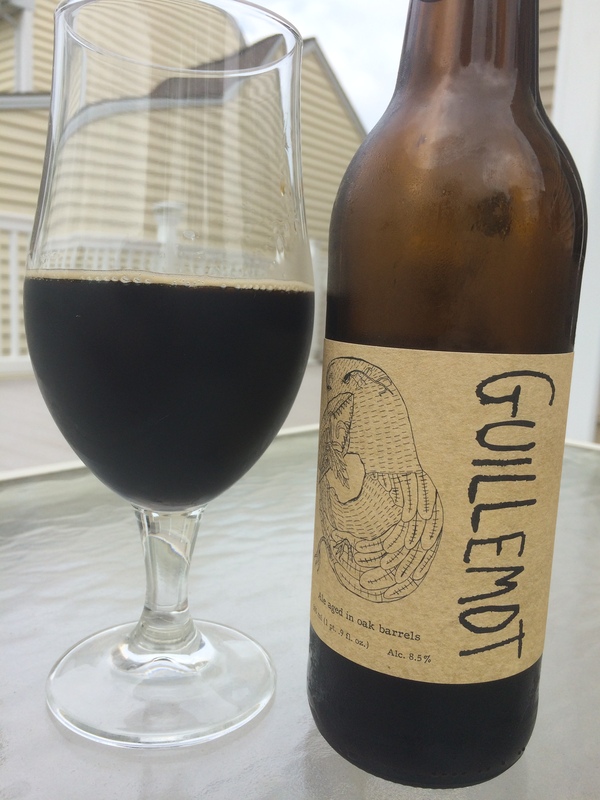 There are probably better Tired Hands beers to trade for, but for that very reason Guillemot could be an easy target if you’re desperate to taste what you’re missing. While this is more a successful novelty than pinnacle of their efforts, Guillemot contains the spirit of the brewery in a 500ml bottle. 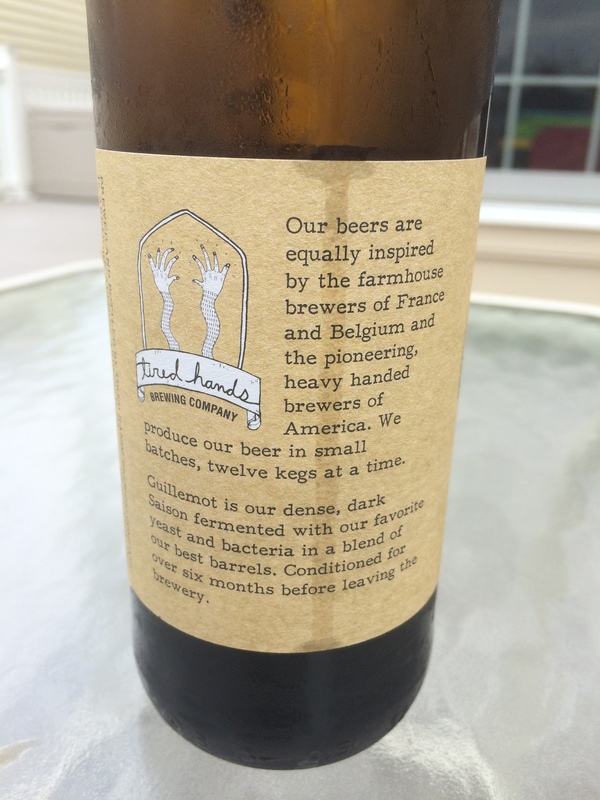 Recommendation: Worth the effort for the adventurous and Tired Hands fanatics. Next Post Beer is Going Back to Camp!